Lazarex Cancer Foundation Founder, Dana Dornsife, first became involved in cancer patient advocacy in 2003 when her brother-in-law, Mike Miller, was diagnosed with pancreatic cancer. Your donation makes what we do possible. Dana Dornsife first became involved in cancer patient advocacy in 2003 when her brother-in-law, Mike Miller, was diagnosed with pancreatic cancer. 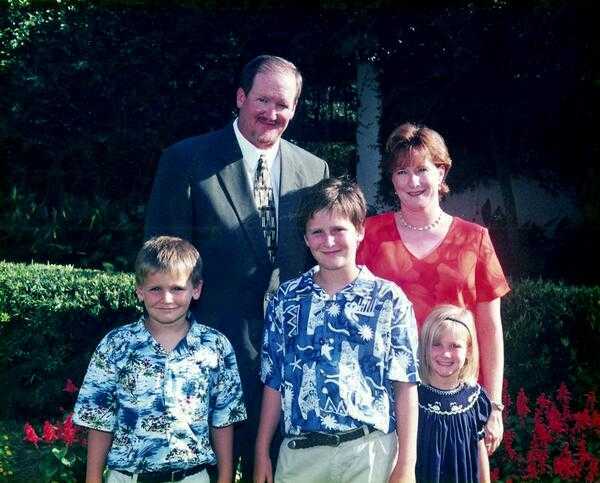 Mike and his wife Erin had three children, the youngest of whom was only four years old. Dana searched for options for Mike that would give their family some additional time together and found a clinical trial. Mike participated in the clinical trial, responded well and lived long enough to help his sons prepare for their future and for his daughter to remember him. In 2006 Dana founded Lazarex Cancer Foundation. 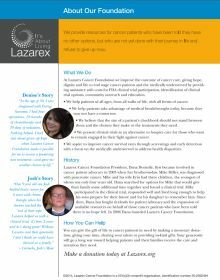 Since then, Lazarex has fought tirelessly for patient advocacy and the expansion of available resources on behalf of those cancer patients who have been told they have run out of medical options and there is no hope left. At Lazarex Cancer Foundation we improve patient access to cancer clinical trials. The vision of Lazarex Cancer Foundation is that everyone affected by cancer will have hope, dignity, support and the most advanced treatments made available to them at all stages of their journey. 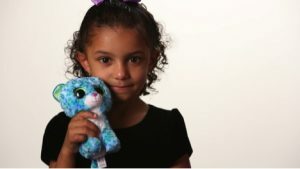 At Lazarex Cancer Foundation we improve the outcome of cancer care, giving hope, dignity and life to advanced stage cancer patients and the medically underserved by providing assistance with costs for FDA clinical trial participation, identification of clinical trial options, community outreach and engagement. We provide resources for cancer patients who have been told they have no other options, but who are not yet done with their journey in life and refuse to give up. We help patients of all ages and walks of life, with all forms of cancer. We help patients take advantage of medical breakthroughs today, because they may not have a tomorrow. We believe that the size of a patient’s bank account should not stand between them and the choices they make or the treatments they need. We present clinical trials as an alternative to hospice care for those who want to remain engaged in their fight against cancer. We aspire to improve cancer survival rates through screenings and early detection, with a focus on the medically underserved to address health disparities. Why Lazarex? What Makes Us Unique? Lazarex is the only 501(c)(3) public charity that does what we do. We focus on helping patients with all types of cancer, of all ages, from all walks of life. 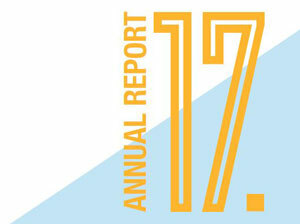 We promote early stage diagnosis to increase survival, especially for the medically underserved. We remove the barriers to clinical trial participation for advanced stage patients seeking life through FDA clinical trials. For these patients Lazarex is literally their last line of defense.